Pet a Pony – one hour, maximum 20 riders, $15 each. Introduces safe behavior around horses, grooming, and tacking, and ends with a short lead-line ride. Groups can repeat this program. Heads Up, Heels Down – one hour, maximum 12 riders, $25 each. Time in the barn to review the basics of riding (mounting, dismounting, starting, stopping, steering), then a 25-30 minute riding lesson without lead-lines. Riders should already have completed Pet a Pony or be comfortable around horses on the ground and in the saddle. Group Riding Lessons (grades 3-12) – one hour, maximum 8 riders, $40 each. Riders can improve their riding skills with a lesson geared to their overall experience level. Instructors use their judgment to determine the appropriate lesson topic and progression. Schedule a one-time visit or a series of lessons to work on specific goals. Girl Scout troops are welcome to register for any of the above group programs as well as the following workshops. Horse Fan Badge Workshop (grades 4-5) – two hours, maximum 16 girls, $25 each. Completes several of the requirements for the badge, including grooming, tacking, parts of the horse and tack, careers with horses, and daily care of horses. Includes a 25-30 minute riding lesson. 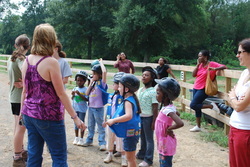 Horse Rider Badge Workshop (grades 4-5) – three hours, maximum 16 girls, $35 each. Two hours of barn lessons and a 45-minute riding lesson to complete badge requirements. Girls should already have their Horse Fan badge and additional riding experience; trotting is required to complete this badge. Horse Sense Interest Project Workshop (grades 6-12) – three hours, maximum 12 girls, $35 each. Two hours of barn lessons and a 45-minute riding lesson to complete five patch requirements. Girls will need to complete two other requirements on their own to earn the patch. Girls should have previous riding experience; cantering is required, or girls will need to do a different requirement on their own. Horsemanship Merit Badge Workshop (grades 6-12) – three hours, maximum 12 boys, $35 each. Basic Package (ages 4-12) We offer a two-hour program of learning about the horses, grooming, and leadline rides plus time for cake and presents. Fee is $225 for up to 12 riders, plus $10 for each additional child. Premium Package (ages 9 & up) We can customize a riding lesson and party experience. 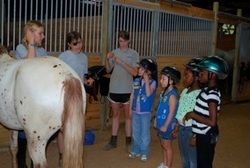 Riding lessons are off the lead-line and will be taught at the overall experience level of the group. Also includes barn lesson in grooming and tacking. Fee is $200 for up to five riders, plus $40 for each additional child. Parents provide all refreshments, cake, paper goods, and table decorations. We provide garbage cans, tables and chairs. Also available at additional cost are themed decorations, dressed-up ponies, goody bags, games, etc.